It’s not just about inviting strange dragons in for pizza and cake. Sometimes the Fox takes me out for chicken and waffles.Can also do chicken without waffles. Or sushi. An overwhelming sense of impending doom can mean a few things: it can be a symptom of neurosis; it can be a symptom of an impending heart attack; it can be a symptom of menopause; it can be a symptom of living in a world where catastrophe is actually imminent. My doctor says it’s not menopause and the fact that I’m still alive suggests it’s not a heart attack, so either I’m crazy or the world is. But everything just seems precarious. At the same time, sometimes I spend months freaking out about problems that could be settled in a day. The world needs magical dragons. But some part of the world fears anything that isn’t regimented and catalogable, anything that can’t be controlled or compelled through conventional means. They try to shame it out of you when you’re little and they try to legislate it out of you when you’re big. But that doesn’t change what someone is on the inside. It just terrorizes them. 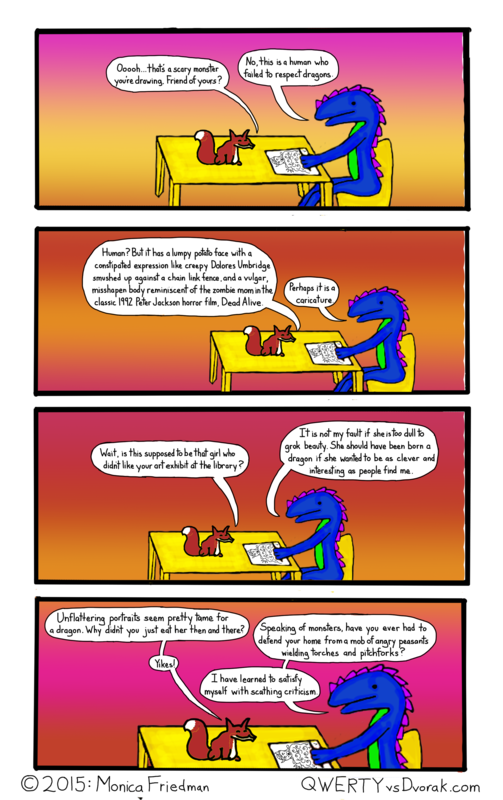 This entry was posted in dragon comics, webcomic and tagged comic, dragon, fear, fox, slaying, webcomic, xenophobia on December 1, 2016 by littledragonblue. No matter what you have, someone else always has more. But then again, someone else always has less. Really, only 2 people out of 7 billion could say otherwise. The Man tells me that most people would be satisfied to be as good at one thing as I am at many things, but I guess I was raised to believe that being good at many things is insufficient if you’re not the best at at least one thing. Obviously, I have everything a dragon could need. but dragons can want things, too. Dragons can have dreams, after all. 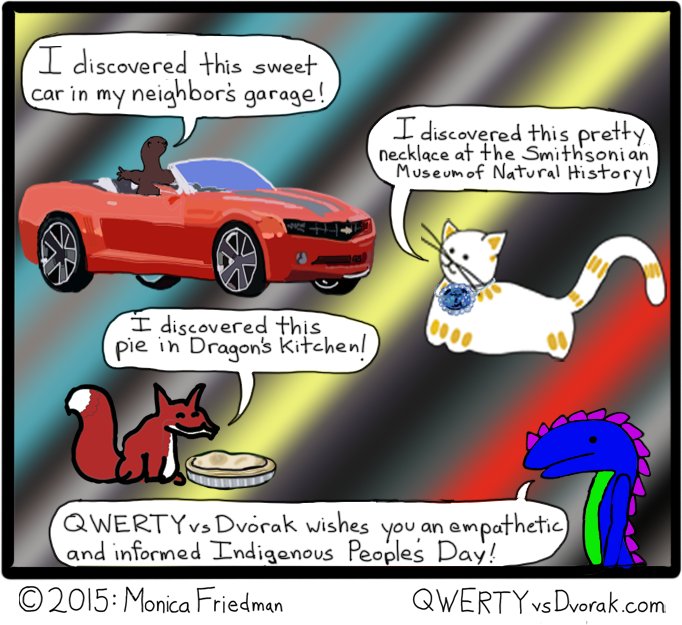 And dragons can be happy for other people and still covet what they have. And that’s all I have to say about that. An old grad school colleague texted me about her residency at the Atlantic Center for the Arts, urging me to apply for the fall. It’s sort of exactly what I want to do. But maybe not exactly. Definitely, I don’t have the 10-page sample comic, and I’m not sure if my skills are quite ready to tackle my big graphic novel project yet. This is what I really want to do: artist in residence on the North Rim of the Grand Canyon. Can you imagine? Best job in the world. Anyway, it’s been a while since the last Dragon Comic. Over thinking is one of my special skills. 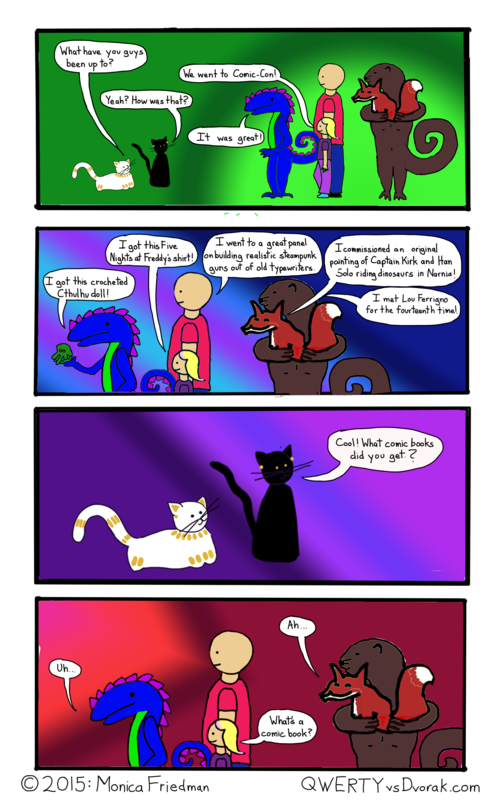 This entry was posted in webcomic and tagged comic, dragon, fox, jealousy, webcomic on March 11, 2016 by littledragonblue.